Spruces are exceptionally tough conifers capable of surviving for up to two centuries in the face of brutal winter cold. 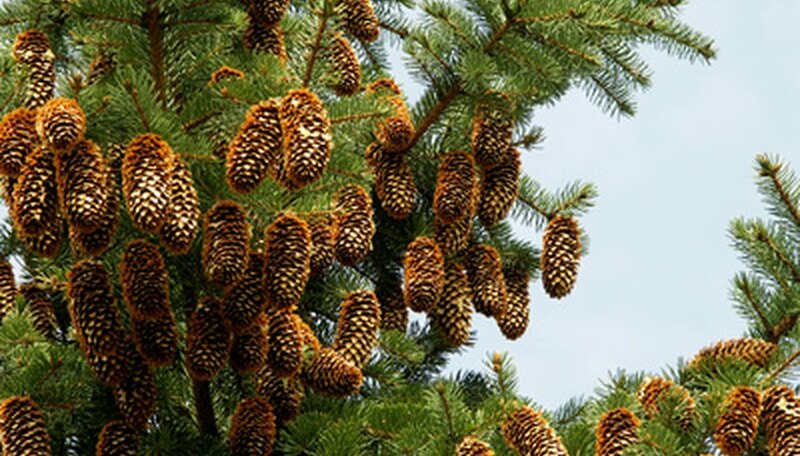 Recognizable from their sharp, stiff square needles and suspended, bractless cones, most spruce species need full sun. Large spruce tree varieties--including Norway, Colorado, Black Hills white and Engelmann spruces--make excellent windbreaks. Smaller cultivars are attractive additions to less spacious yards. Like all evergreens, spruce trees have specific fertilizer requirements. As conifers, spruce trees perform best with fertilizers that have nitrogen (N) levels higher than their phosphate and potassium concentrations. Reading the three prominent numbers on the fertilizer's label reveals its respective percentages of each ingredient. The nitrogen percentage (N) appears first, followed by the percentages of phosphate (P) and potassium (K). Spruce trees need fertilizers with nitrogen levels of less than 10 percent, say Montana State University plant disease diagnostician Martha Mikkelson and colleagues. Diluting fertilizers with higher nitrogen levels with water is acceptable. In spring, deciduous trees must replace the leaves they dropped the previous autumn. Healthy spruce trees, however, shed their needles only once during a three- to six-year span. This economical needle production means that spruces require many fewer fertilizer applications than deciduous trees. Fertilizing these trees is a matter of waiting for them to show that they need it. Stunted needles, slow growth, discolored foliage and dead new twigs are some indications that a spruce needs fertilizer. Yellow needles over an entire tree are an indication of iron deficiency. Purple needles are a sign of low phosphorus levels, advises Doctor Bert Cregg, Michigan State University associate professor of horticulture. Yellowing needle tips mean a spruce tree needs more magnesium. As spruce trees can develop these symptoms for other reasons, testing the soil before applying fertilizer is advisable. Fertilize newly planted spruces with slow-release pellets scattered just beneath the trees' roots. Fertilizers older trees during the spring after the final frost date. Liquid fertilizers are more likely to reach the trees' roots. Watering the trees thoroughly after applying dry fertilizers improves their soil penetration. Avoid fertilizing spruces in summer. Fertilizing too late in the year can stimulate autumn growth that will die back in freezing temperatures, advises University of Minnesota extension horticulturist Deborah Brown. The exception to this rule applies to trees growing in extremely poor soils. They may benefit from a late summer or fall feeding with slow-release fertilizer to get them through the winter. Apply enough fertilizer to provide 2.4 ounces of actual nitrogen per 1000 square feet for spruces less than 6 inches in diameter, recommend Mikkelson and associates. Mature trees should get no more than twice that amount of actual nitrogen. Multiplying the percentage of nitrogen listed on the label by the weight of the fertilizer bag determines how much actual nitrogen the bag contains. Spreading the fertilizer evenly over an area 1 1/2 times the diameter of the trees' canopies ensures full root system coverage.